eMarketer covers digital marketing trends, media and commerce, offering insights essential to navigating the fast-changing digital marketplace. Their resources will help you plan, develop and implement your digital marketing strategies. Techvibes is Canada's leading technology news aggregator. The site covers social, mobile, and startup news that impacts Canadians and others in the tech industry. The site has a job board, events calendar, company directory, etc. Worldometers provides real-time world statistics in a time relevant format for people to view worldwide. The counters display the World's population (current population, year-to-date births/deaths), stats on Government & Economics (bikes & cars produced), etc. TechSpot is a tech news and analysis site. Covering up-to-date information for IT enthusiasts and professionals with a monthly readership of over four million. You can find reviews, buying guides, products; join a forum, etc. Totem is a press page builder for businesses. To create a press page for free simply sign-up for an account, fill-in the information in the boxes, and submit to get your press release. An upgrade is available for more customization to your press page. 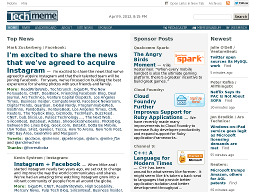 Techmeme.com Retrieves tech news headlines in real time to bring you the latest breaking stories. The site is driven by a mix of industry insiders, passionate independents, and established journalists. 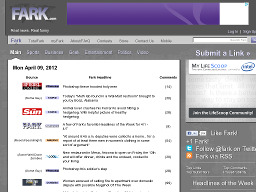 Fark.com A popular news aggregator and an edited social networking news site that receives 2,000+ news submissions from its readership daily. Wide variety of content. 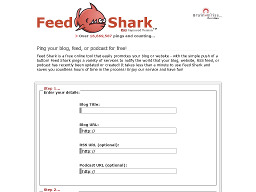 Feed Shark Feed Shark is a handy online tool that allows you to freely submit a RSS feed or blog to over 20 sources. Afterwards you may want to take a peek at the selection of articles offered on the parent site, BrainBliss.com. 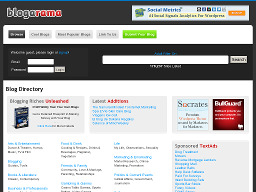 Blogarama.com Blogarama.com is one of the best directories of web logs (blogs) and journal sites on the Net. Add a blog site or look through the rated blogs already listed.